We’re approaching the end of the year, and as the autumn draws near, so do 2019’s new model cars. For every new car being released, there’s a number of aesthetic changes and quality of life improvements for consumers to enjoy. Sometimes changes are more conspicuous, and the new version of a vehicle is easily distinguishable from its predecessor, but other times the differences are more discreet. While performance upgrades might not be quite as visible as other changes, most people would probably agree that they’re measurably more important than any kind of cosmetic update. Whoever designed the 2019 Ford Edge must have thought so too, because nearly every notable modification to the standard design happens beneath the surface. If you’re familiar with previous versions, the first thing you’ll notice when you’re considering the 2019 Edge is a difference in available trim levels. Last year’s model had four trims, the SE, SEL, Titanium, and Sport. This time around, we’re being treated to five options, not just one but two of which are completely new. The luxurious Titanium trim is getting a facelift drastic enough to warrant a whole new trim: The Titanium Elite. The Edge sold better in 2017 than it ever had before, and as crossovers grow more popular people start investing in higher trim levels, so it makes sense that Ford would expand on one of its most popular options. Contrary to what the name may have you believe, the Titanium Elite doesn’t have any upgrades to its interior technology beyond what’s available with the already-established Titanium trim. Instead, all of the changes come in the form of aesthetic updates to the exterior. The most significant change is the inclusion of 20-inch wheels completely exclusive to the Elite, but full body-color sides are also featured. The Sport trim is being removed entirely, and in its place, Ford is offering the Edge ST. For anyone who doesn’t already know, ST stands for “sports technologies,” which is Ford’s way of labeling a trim that’s been built with a very particular level of performance in mind. A glossy black mesh grille adorns the front, with the ST badge proudly and prominently displayed. The seats are heavily bolstered, similarly to what you might see in traditional racing vehicles, and they have leather trimming as well. A 2.7L V6 EcoBoost engine with an 8-speed automatic transmission is at the core of the ST, providing 335 horsepower and 380 lbs per foot of torque. Traction-enhancing all-wheel drive coupled with a sport-tuned suspension delivers the best possible comfort and handling you could hope to find in a crossover model. The automatic transmission system is controlled by a dial in the center console, and in the middle is a button that activates sport mode. It’s no wonder Ford decided the name Sport wasn’t worthy enough for this new trim. While the 2018 Edge had three available engines to choose from, the 2019 edition features a shorter list of options with only two. Current models can still be outfitted with a 280-horsepower 3.5-liter V6, but other than the engine mentioned for the ST trim, next year’s Edge has only one option. Just like 2018, the new Edge comes equipped with a 2.0-liter EcoBoost four-cylinder, built to add a dash of metaphorical seasoning to your daily commute stew. The fact that it’s the standard engine for the base trim might be enough to make some people consider springing for the ST and its exclusive engine instead, but by no means should this standard option be considered a basic one. It goes by the same name, but the 2019’s 2.0-liter delivers improved performance and efficiency in comparison to older models, providing 250 horsepower with the same level of torque, as well as newly implemented automatic start/stop technology. 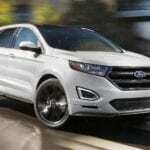 That isn’t the only capability boost that the new model Edge is getting, though; it’s also bumping its standard transmission from 6-speed to 8-speed, which should help increase both fuel efficiency and engine proficiency. Out of every area, the one place where the 2019 model Edge truly excels beyond its predecessors is in its safety technologies. Ford is introducing a brand new collection of safety and driver-assistive features, organized to work in conjunction with one another to provide an added level of protection on the road. As far as the safety of you and your family is concerned, there’s nothing more important, and features like these can be critical when you’re facing a hazardous situation. The Edge is the first car to be outfitted with this safety compilation, dubbed the Ford Co-Pilot360, and it all comes completely standard. It just goes to show how much Ford cares about their customers, that they would provide so many premium safety features on a base model, and I’m genuinely unsure if there are any other manufacturers who have been willing to do the same. Most people are already familiar with rear-view cameras in vehicles, so the inclusion of that feature should come as no surprise to anyone. The majority of drivers are still behind the wheels of older vehicles, though, and so most of them haven’t had the chance to experience the latest advancements in safety tech. Hidden sensors are spread around the exteriors of most newer vehicles, and are used for virtually every kind of modern driver-assistance system. Front sensors have the ability to detect incoming obstacles or pedestrians and then issue an alert using Forward Collision Warning. If you can’t respond in time then the Automatic Emergency Braking system will, softening impacts at high-speeds and preventing them entirely at lower speeds. BLIS with Cross Traffic Alert is a multi-pronged blind spot monitoring system, designed to help maintain the best situational awareness possible when things get hectic. A visual indicator lights up on the side-view mirrors to let you know if you need to wait for another driver to pass, and in case you forget about it, activating your turn signal with a vehicle in your blind spot will cause the indicator to begin flashing. When you’re in reverse, the system will warn you of vehicles approaching from either side by communicating an alert from the speakers, as well as visual warnings from the mirror indicators and information display. Ford’s Lane-Keeping Alert and Lane-Keeping Assist are two features that together make up their aptly-named Lane-Keeping System. Surprisingly similar to the established concept behind rumble strips, the alert function vibrates the steering wheel (with a configurable intensity) to notify you if you’re starting to drift into another lane. The assist aspect of the system acts as a sort of buffer, adjusting your steering to compensate for gradual drift and keeping you centered. When you’re researching brand new cars it isn’t hard to find yourself convinced you’re looking at an earlier model, only to be met with a pleasant surprise later when you take a closer look. This will probably happen to a good number of people when they see the new Ford Edge, due of course to its strikingly similar appearance to the 2018 Edge. However, despite its lack of aesthetic updates, the 2019 Edge still stands well above 2018, a perfect example of why not to judge a book by its cover.